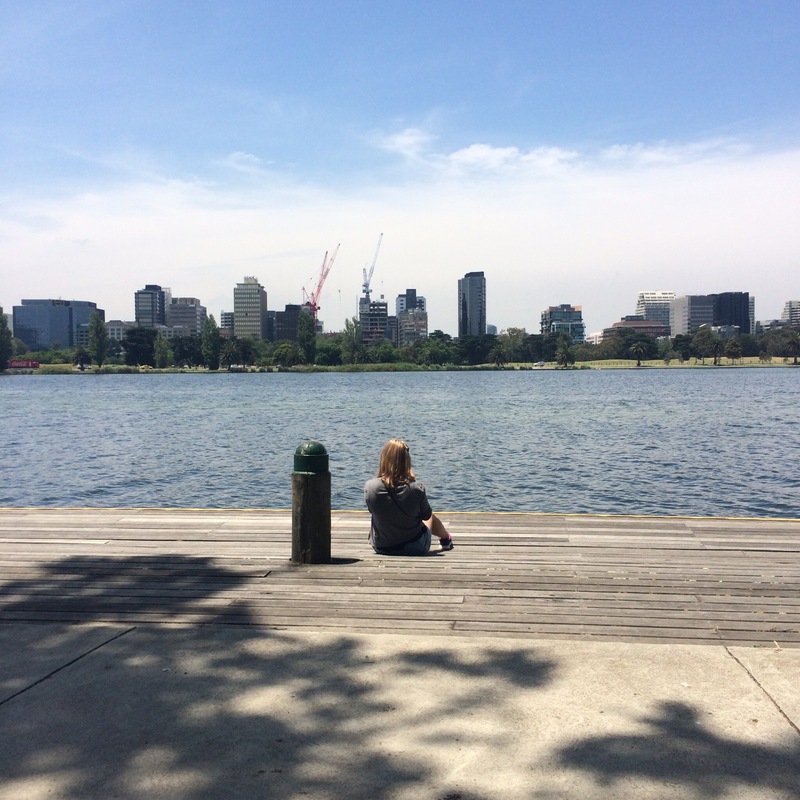 Australia knows how to exploit their vast amount of space and nice weather – lots of parks. 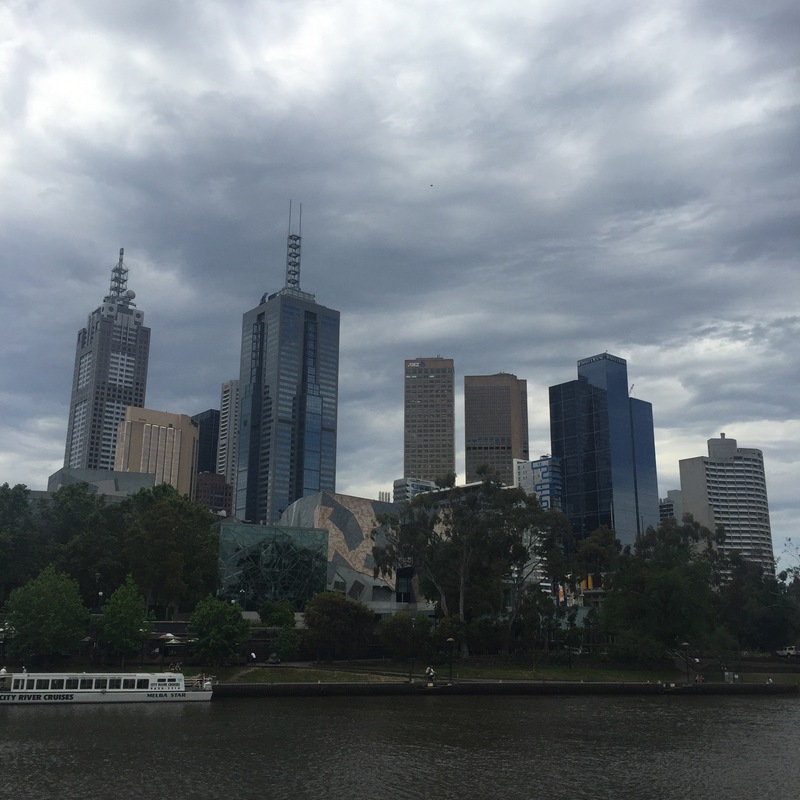 Every city we have visited has always had a range of parks to explore and relax in but I think Melbourne’s (as far as we have seen anyway) is winning the park award from me! It has taken us days to explore them and I’m still not sure if we have been to them all, but I’ll try give a breakdown of where we have been below. This park overlooks the river and is in the centre of town. There is actually a park on either side of the river (the other being Birrarung Marr) which is cool and a lot of the parks run into one another. We had a particularly sunny day to see quite a few of the (but not in the picture below). Alexandra Park has the rowing clubhouse on it and we saw loads of rowing teams out practising while we were there. You get some great views of the city skyline too. It’s not my favourite of all the parks we have visited but is really nice having open spaces in the middle of the city. The Carlton Gardens overlook the Royal Exhibition Building which was built in the 1800s as a ‘Place of Industry’ to exhibit the technologies and achievements of the mechanised age. It is still used for exhibits today. The building is gorgeous and is nice to see after walking trough such a modern city. Whilst we were there a group of dancers were being filmed for what looked like an Asian music video. The lonely planet described this place as a three tiered park which I guess it is but I think it doesn’t give you the right picture. There is a large grassed area which would be one of the tiers and this is the biggest area in the park but then the other two ‘tiers’ are a lot smaller and are really just paths along the river so its not always clear that there are actually three tiers. Despite this, its a cool park for functions – in the few times I’ve walked through the park there has been a fair trade/vegan/help the animals type fair and a noodle market so it seems to be the place for Melbourne events. This park is really near to where we live so we have been here the most. It’s really big and has loads of trees where, if you’re lucky, you’ll see possums (we are yet to see any) as they come out at night. As well as this garden having vast open spaces to relax, there are a lot of water features with sculptures around or on them and other attractions to see as you walk around. For some reason (I really don’t know why) there is a small model of a Tudor village in this park. I don’t know if it’s something to do with the history of the area but the model depicts a full village in minature and has a cafe next to it so that you can drink coffee whilst looking out over the tiny town. Another attraction signposted in this park was ‘the fairies’ tree‘. 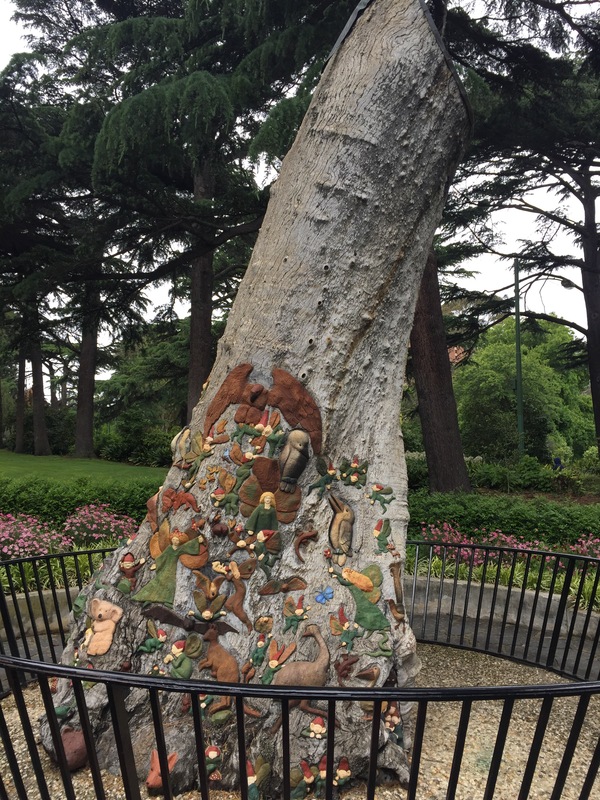 This was intricately carved and had been sculpted by an artist called Ola Cohn in 1932 and was specifically made for that park as “a gift to all the children of Melbourne”. This garden also has a building which is advertised as the ‘oldest building in australia’ as it was built in 1755, but it was actually built in Yorkshire and then in 1933 it was sold to an Australian who moved it over here. The park has so much to see and read about and you can spend hours wandering the grounds. The final part of this park is a very pretty conservatory which makes me think of something from Downtown Abby with the types of flowers on display. It was lovely to have something like this in the park and seems to be quite common in the parks we have visited. This is probably one of my favourite parks as it’s so big and there is so much to see. 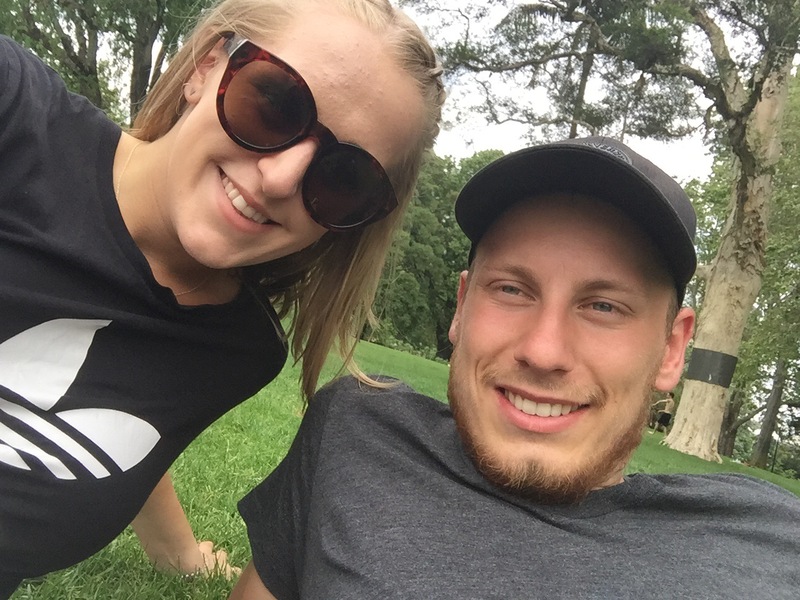 As its so near our house, we have been a few times as well as with Kathryn and Laura (who we are staying with) – can’t wait for the weather to continue to get nicer! As the name suggests these parks overlook the Treasury Building and are pretty standard as parks go but still lovely once you get a bit of sun. There are tree lined paths and open spaces which are used a lot by the white collar workers in the area. We didn’t get to spend long in this park the first time we visitted as it started to rain really heavily but there were some good sculptures dotted about which we got to see and we did go back when it was sunnier another day to see it properly. Another strange thing about this park was that there was a memorial for JFK which we still don’t really understand but there you go. This park runs along from the Alexandra Park. It’s not very big but has a statue of Queen Victoria in it as well as a lot of lovely sculptures. It’s hard to know when one Park ends and another begins but you’ll see this if you are ever in Melbourne and spend a day walking through all the parks. The gardens do have excellent views of the city skyline though (a favourite view of mine) which is worth going to the park just for that! I think this is one of the biggest parks in Melbourne (purely going on how it seems not on any research) and it includes so much! Inside this park is the Sidney Myer Music Bowl. Niall, Kathryn, Laura and I came here on a sunny Saturday and when we were walking through the parks there was a free musical event on here. We were given inflatable pillows and jelly beans and relaxed in the sun listening to Latin music and watching flemenco dancers. When we left people were arriving to see an opera night which was a ticketed event so we didn’t stay. 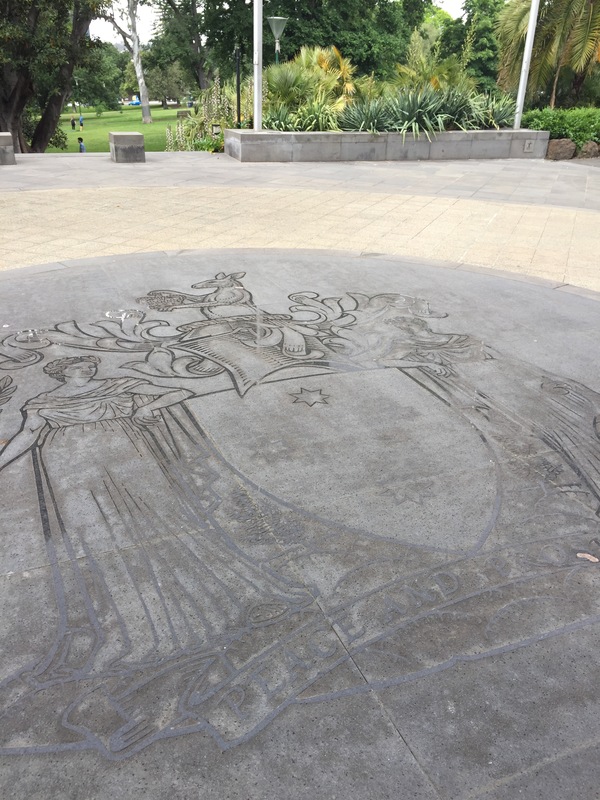 This park is also full of different war memorials leading to the Shrine of Remembrance which is a grand Anzac (Australia and New Zealand Army Corps) memorial dedicated to all fallen soldiers, particulrly during the world wars. The Shrine of Remembrance has increidble views of the Melbourne skyline. The memorial is enormous and has a fire pit that constantly burns for the lost soldiers. There is a service on everyday for a few minutes which is a ray of light over the word ‘love’ in a stone carving which says “Greater Love Hath No Man” and a remembrance message is said over the speaker. This park has a lot to offer and the Shrine of Remembrance is a must see if you visit Melbourne – its really spectacular. The skyline from the shrine is one of my favourite views in the city, I could sit and watch it for hours. Every big city seems to have a Botanical Garden in them. 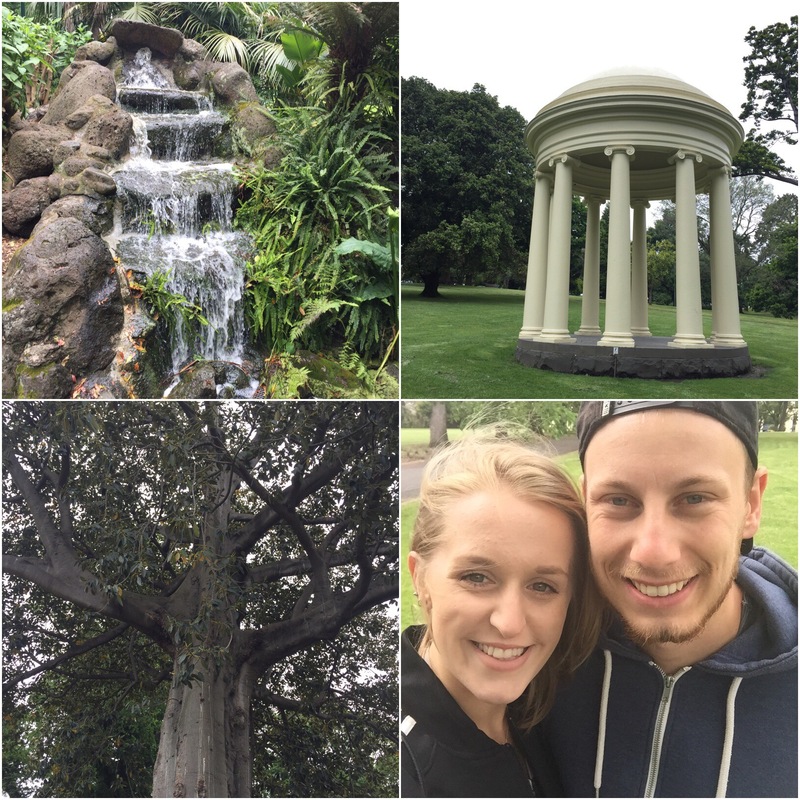 Melbourne’s gardens are really nice and, as well as all of the beautiful flowers, there is also a big lake where you can get punting rides across it as well as there being a huge and fancy tearoom (which we couldn’t afford). We went there on a Saturday and saw at least two weddings taking place in the gardens – a gorgeous setting for a wedding and the weather was perfect too! This is a little park in the city centre near the docks which houses the Melbourne tennis club and bowls club. There is a playground and there were lots of sunbathers dotted around on the grass. The gardens originated in 1840 as a lookout onto the docks and a place to send messages using flags from the city to the harbour. This isn’t really a park to bother with unless you’re passing but, if you are and its a nice day, you may as well have a walk through it and relax. Unfortunately the name doesn’t have anything to do with THE Batman which is a bit of a shame – its actually named after someone called Mr Batman so at least he benefitted from having a cool name and a park named after him (not sure why he got it named after him though). Loads of people were doing exercise in this park and the views of the city are great but apart from that, its just some grass by the river so not anything note worthy. This park was a bit further out of the city and we had to get a tram to it which took around 15 minutes from the city centre. We loved this park. It was a beautifully sunny day and the park shows great views of the city skyline. I am a big fan of parks with water (as you can probably tell from this post) and this park didn’t disappoint as it consisted of an enormous lake. The lake it quite narrow but very long and it took us over an hour to walk all the way around it. It’s not a hard walk – there is a path around the whole thing – and it’s definitely worth doing. There are seats dotted around facing the water, a playground at one end for kids, grassy areas to relax as well as wooden decking which were being exploited by sunbathers when we were there. This lake is also where the F1 Grand Prix is held, there are no indiciations of this being here so there must be a lot of work when its on with stands needing to be built. We went during the week so I imagine it being a lot busier on the weekend. There is a boat club on the lake and there were some boats docked in the water so I imagine the water becomes a lot more lively when everyone is off work on a sunny day. The lake also has swans and, when we were there, we also saw some baby swans too! This park, like so many others we have seen in Australia, promotes exercise and we saw a lot of runners while we were there. As you go around there are points to stop and do different exercises as well as a board that talks you through checking your pulse and exercising well. It’s a really clever idea and makes so much sense considering the nice weather they get – I can’t see it being as successful in the UK mind. All of the parks we have been to have been lovely and really well used. It would be lovely to exploit your lunch breaks with beautiful scenery and fresh air just outside your office. I know as the weather continues to improve (we are finally getting a good string of sunny blue skies instead of windy grey ones!) then these parks will become a big part of our daily activities in Melbourne.